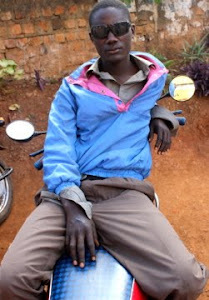 Bodaboda Baby: Impounded, for the first time ever, and other breaking boda news. 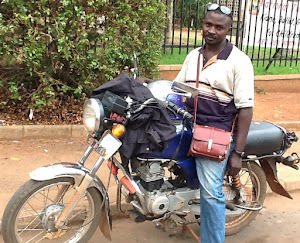 Impounded, for the first time ever, and other breaking boda news. 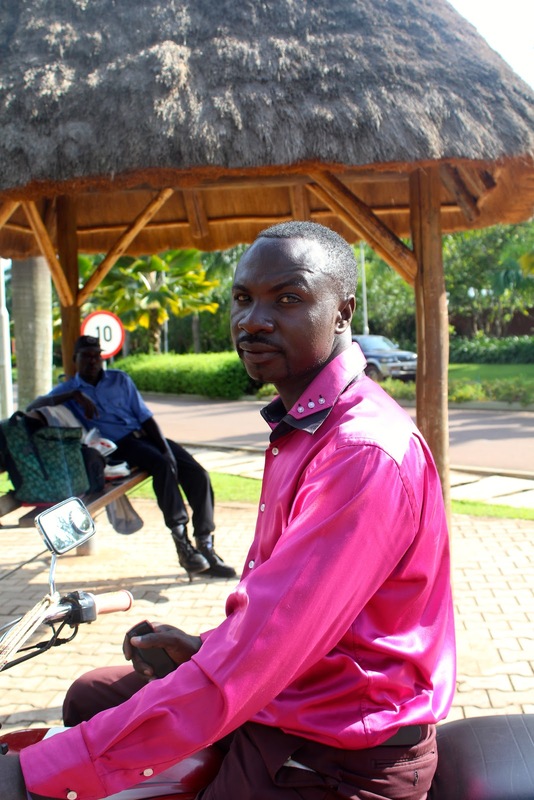 As you'll read below, satin shirts teamed with wristbands are all the rage for boda drivers in Uganda. 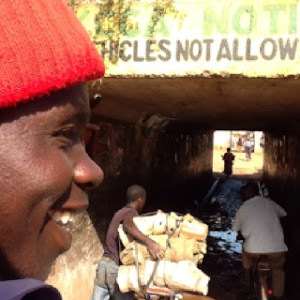 Breaking boda news this Wednesday March 13 2013. *Yours truly impounded for the first time ever. Yes, you're reading this correctly. 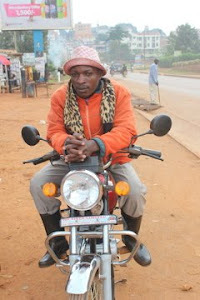 For the first time ever, a boda driver taking me into town was impounded yesterday afternoon by a copper for not wearing a helmet. And all this time we thought the author of the blog was the one who didn't want to wreck her blow dry. I'm not making this story up. The incident happened as we approached Garden City. I was on the far left hand side of the road, the side heading towards Acacia Avenue. 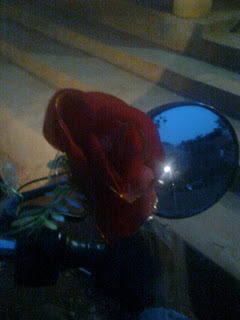 The officer swooped as the rider had momentarily stopped in the traffic, forcing him off the bike and wheeling it away but leaving the author of this blog still on it in heavy traffic in heels. (Thanks so much, Sebo). When I asked him what was happening, the policeman told me that the driver wasn't wearing a helmet. 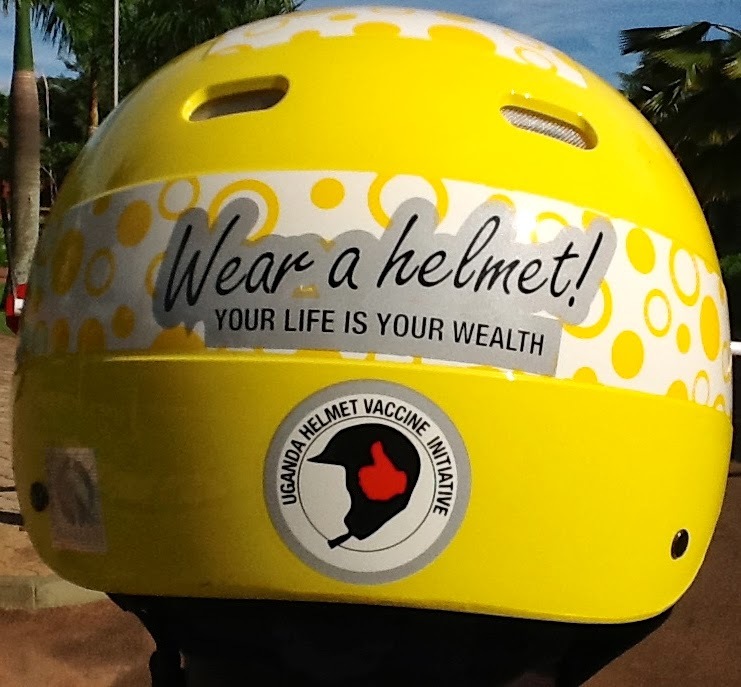 The rider then tried to tell the person in authority that he'd thoughtfully given me his headgear, to no avail. To be honest this incident seemed a bit random, considering there were scores of other drivers whizzing around with no helmet on either. I managed to eventually swing both legs off the bike without having one amputated in the traffic before it was taken away (phew) and cross the road. But I couldn't help thinking later, while reading this Daily Monitor story, what if I'd had even a "drop" of a sneaky afternoon G&T? Would I have been arrested, under stringent new measures which will reportedly lead to pedestrians being detained for “drink-walking?" 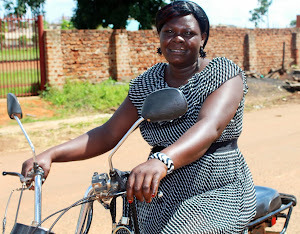 This incident comes after a source in the Old Dart informed me that during the recent screening of Top Gear Uganda there Jeremy Clarkson stated that the only legal exemption from wearing a helmet is a female having had her hair done. Someone's joking here - who is it? I haven't watched this particular episode of Top Gear yet, but if anyone can please shed any light on this important matter it would be greatly appreciated. 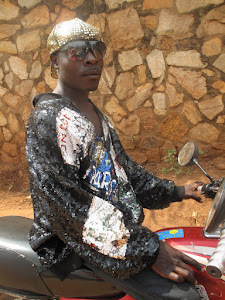 In the meantime Bodaboda Baby will try to seek clarification from the IGP on whether helmet hair is a legitimate excuse for eschewing headwear. *Satin shirts de rigueur for passengers - and drivers. 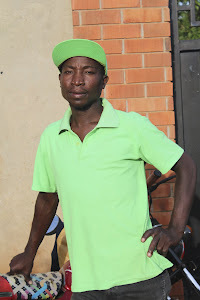 I first became aware of the satin shirt trend last year when I spotted this boda passenger below getting onto a bike sporting this number in Electric Blue (coincidentally, the title of a song by iconic 80s Aussie band Icehouse - see below). He'd teamed it with white bottoms that Elizabeth Hurley and Pippa Middleton would probably fight it out for. (Of course they'd wear theirs a lot tighter, though). Very brave of him, on the dirt roads. The author of this blog has herself perused many white pieces for her wardrobe in the past year, but passed up every single one of them after a voice in her head asked how would that look with mud? I'd forgotten about the blue satin shirt, dismissing it as a one-off, until I spotted its fuchsia counterpart being worn by boda driver Peter Kiiza, near the Clock Tower yesterday afternoon, following my previous driver's impoundment. 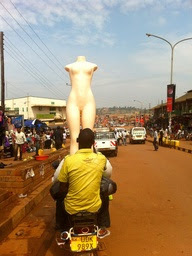 (A lot can happen in a day, in Kampala). 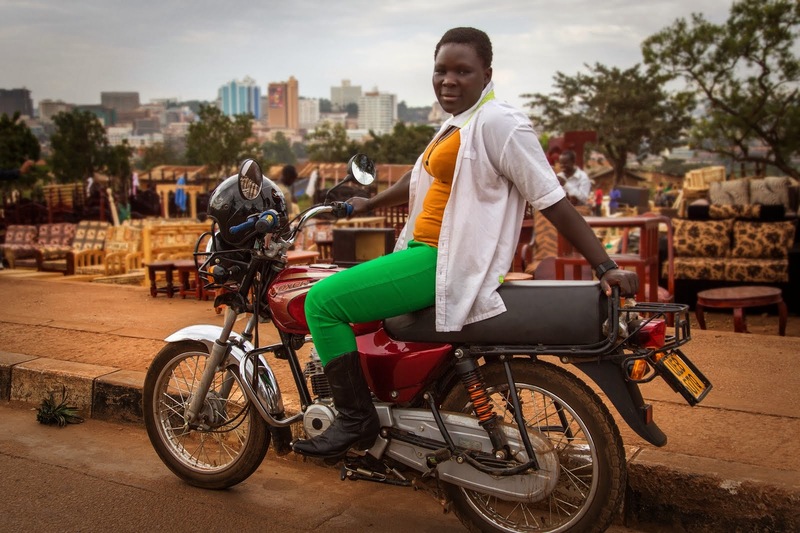 After some enquiries Pete, a 30-year-old rider with five years' experience, told me he'd bought the blouse, which had white buttons, in town for 20,000 Ugandan shillings ($7.58) last year. 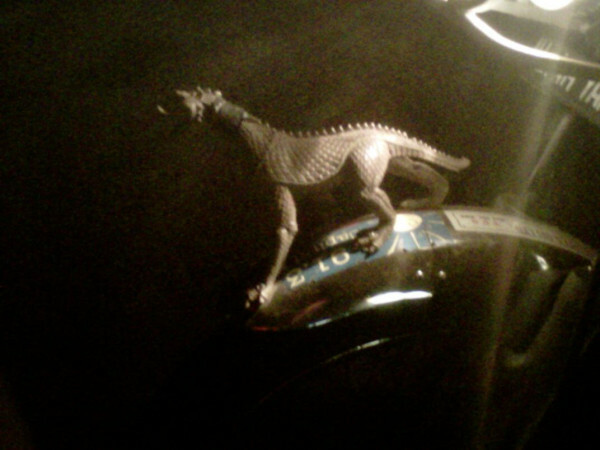 "It was the trend by then, when I bought it," he explained. Pete may have God on his side but he also has fashion. "Since I've been growing up I want to be smart." Yesterday he chose to team the shirt with brown trousers from Owino, shoes also from Owino for 50k and socks from Nakulabye for 2k. Oh, and don't forget the wristband he picked up from a supermarket for 3k. 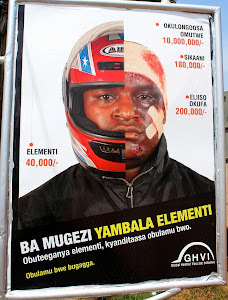 Bracelets, it seems, are mandatory for boda drivers these days, perhaps more important than helmets? Pete drove off blowing yours truly a kiss (of perhaps it was for the staff at Bean Cafe?). We wait to see if he'll be in touch. 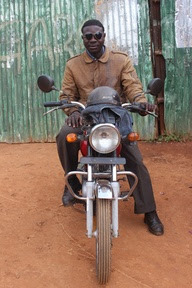 Yes, he's really a boda driver. Not a model I just rented for this blog post. Later at Bean Cafe, trying to blend in (dream on). 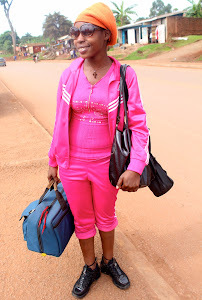 Either way, we now know there's at least two satin shirts on the streets of the Ugandan capital - are there any more? Oh, and here's the original Electric Blue (for any fellow Aussies reading this). 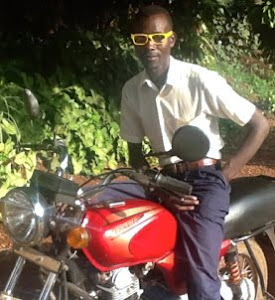 * Boda boda riders training school in offing. This was a headline in Sunday's New Vision and has been pointed out to me by a number of readers of this website, including Silver Kayondo. 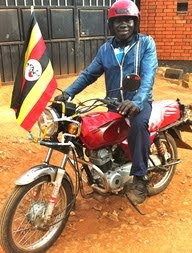 According to the story, which quoted the director of industrial training (DIT) in the education ministry Sam Masolo, a training school for riders will be set up in Kampala by motorbike manufacturing firm Yamaha to reduce accidents. DIT will support the school. 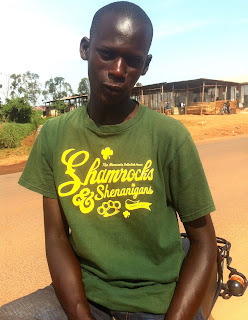 Masolo said police statistics show that (look away now, please Mum) boda accidents kill 500 people and injure another 1,200 in Uganda annually with unskilled drivers mostly to blame. * Boda riders may believe in dragons. Or at least if the photo @spectacularanna Tweeted me yesterday morning, which she took opposite Yujo Sushi on Sunday evening is anything to go by. 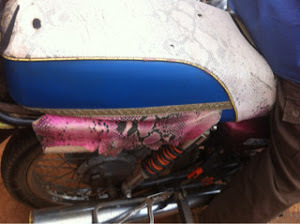 The dragon, which she said appeared to be metal, was on the front mudguard of the boda that Spectacular Anna took to Kisementi. Photo courtesy of the lovely Anna Kucma. Thankyou. 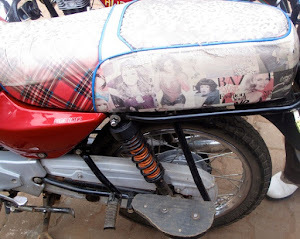 Is this not the best boda mudguard ever? Thanks for sending this in, Anna you are spectacular (not only for this but also for your recent START journal article on the motivations of art collectors in east Africa). It's good to know bodas aren't scared of all animals as Prince William, I discovered one day when he nearly jumped off his bike, is petrified of cats. 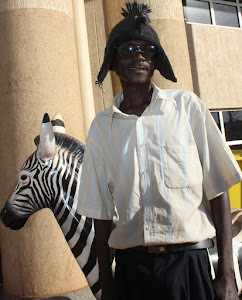 * And finally, a request for St Pat's Day bodas. We've had a Christmas boda and a Valentine's boda. In the lead-up to St Patrick's Day on March 17 will we see a shamrock boda? Regular readers of this blog will recall my meeting with Joseph, who was sporting a green t-shirt with the words "The Minnesota RollerGirls present Shamrocks & Shenanigans March 21, 2009" emblazoned on it. I got the impression that Joe probably wasn't sporting the top in honour of Ireland's patron saint, so he's therefore classified as an "accidental" St Paddy's Day driver. 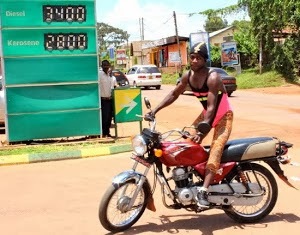 But with just three days to go, will we see an intentional St Pat's Day boda? It may be a good idea - after all having the luck of the Irish on Kampala's potholed roads probably wouldn't be a bad thing. Any sightings can be reported here. Unintentional St Pat's Day boda, Joseph. 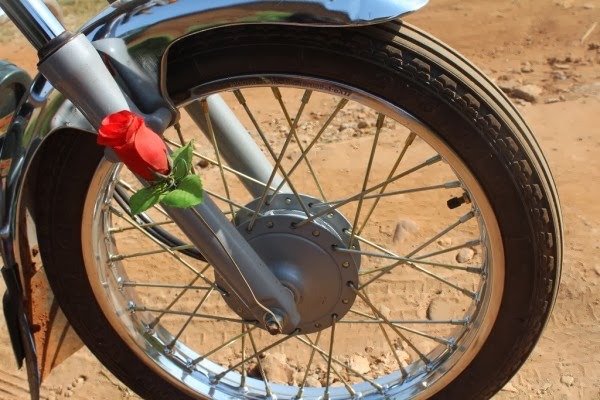 We've had a Valentine's boda. 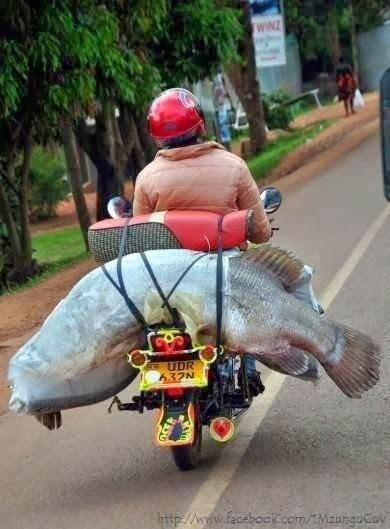 Will we see a genuine shamrock boda on or before March 17?